First published on September 14, 2015 now updated exactly one year later with new photos on September 14, 2016! I knew what I wanted in my kitchen – a red kitchen island with a butcher block top on wheels but I’m not always the sharpest tool in the shed, sometimes it takes awhile for me to see what is staring me directly in the face. My great grandpa’s radio stand made me the perfect kitchen island! My mom and I pulled this radio stand out of the old play house (along with a pile of other furniture) and I really didn’t know what to do with it. I set it aside and got to work on the many other pieces I already had until I literally dwindled down to it. I even thought about giving it away as I just couldn’t figure out how to make it functional. It was very cool and rather pretty though it did have some veneer cracking and missing on the front of it (as you can see in the before) so I had planned to probably paint it regardless. But if you stand it against a wall it is either useless as a shelf or you have to face the prettiest part of the whole piece to the wall. I just couldn’t figure out how to use it in a functional way so I put it out of my mind. Meanwhile, I knew all along I wanted a butcher block red kitchen island and I have also always wanted a book shelf in my kitchen for all of my recipe books and things so I got to work designing an island. It wasn’t very big and it was basically a small bookshelf on wheels. I didn’t want to build it (I’m not a builder, I’m a recycler) so I was planning on probably finding something at the salvage yard. When I painted it I taped up the “fabric” to keep it its original gold color though you can see it looks kinda stained… I may decide to paint that a separate color at some point. I put two coats of primer on it, three coats of paint and then two coats of poly acrylic, which I also put on the fabric (front and back) to help protect it. My biggest worry about it is that it was never very sturdy. I cut two 2x4s to set it on and screwed up through them into each leg as carefully as I could. This was a bit tense as I had to be perfectly straight or the screw would have burst out the side of one of those pretty legs. Then I added big castors so it has no reason to lean when it is pushed, it will just roll. On top of that I added slats of oak I had left over from my counter tops that I covered the bottom with to add even more support. Check out my tutorial How to: Build your own butcher block! Update 9/15/16: New photos to enjoy! Hey guys, I can’t believe I’ve almost been blogging for a whole year now! 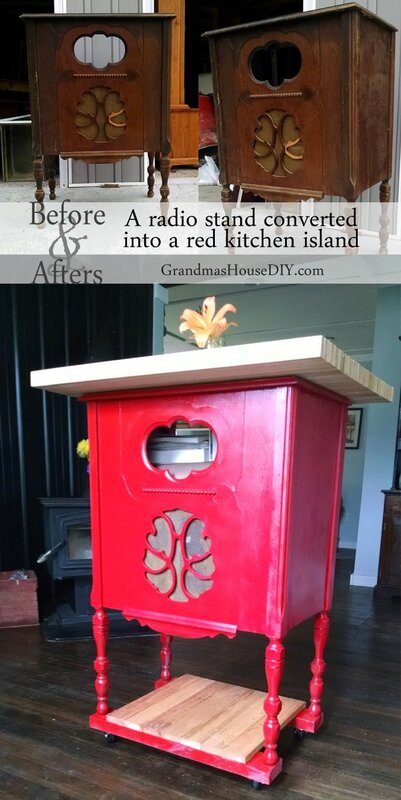 This radio stand I converted into a red kitchen island remains one of my top posts here however, I never liked the pictures I had for it. The bright red was really hard to capture accurately and the previous photos I thought came out far too magenta. When I took pics for my big kitchen reveal (check that out here) of course my red kitchen island radio stand was the star of the show! So I was able to retake a whole bunch of photos! I am so happy to see that the colors came out so much truer to real life. This turned out amazing! I love finding new purposes for old useless things just like you did perfectly here! Thank you! I was so relieved to find a purpose for this old radio stand! It seemed far too pretty to just let go! Oh my goodness thank you so much! That’s fantastic! This is really nice repurposing. I love that bright red color you chose. Thank you!! I most definitely will! What a terrific project, Tarah–so much creativity and planning. It’s such a great feeling when everything “comes together,” isn’t it. Great job and thanks so much for coming to our Vintage Charm link party 🙂 It was so nice to meet you! It was wonderful to meet you too! Thank you so much! This is a darling transformation. I love the bright cheerful red color. Thank you so much and for providing us bloggers a place to post some of our projects 🙂 I’ll definitely go check out the board! And thanks again! Thank you so much Lucinda!! Oh thank you sooo much!! Tarah! What a great vision you had to give this little stand new life! It looks great! Well done! I hope you have a great day! Thanks Terry I hope you have a great day too! 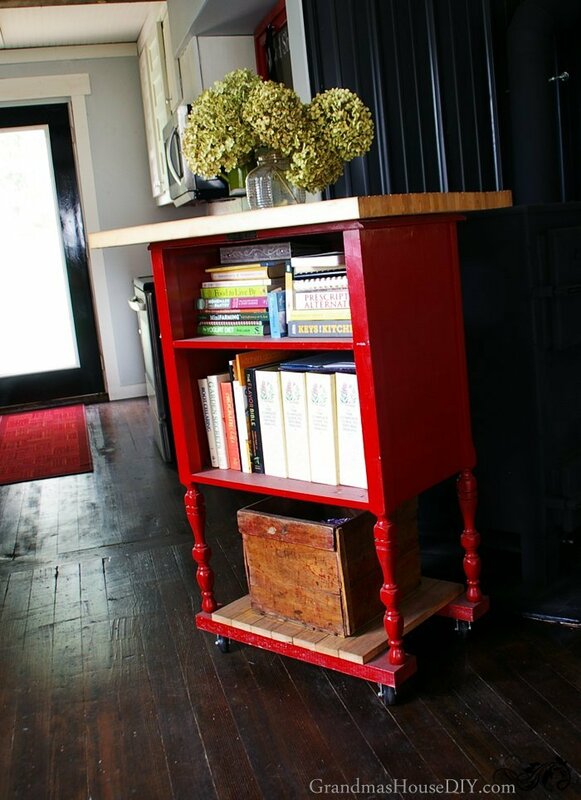 What a fun repurposed piece just perfect for some extra landing space and for storing those cookbooks. It is so handy to have them close at hand. I love the fun red color! Thanks so much for sharing over at Celebrate Your Story! Thank you Chloe! I love love love my island especially because of all of the cook book storage, thank you so much for stopping by! 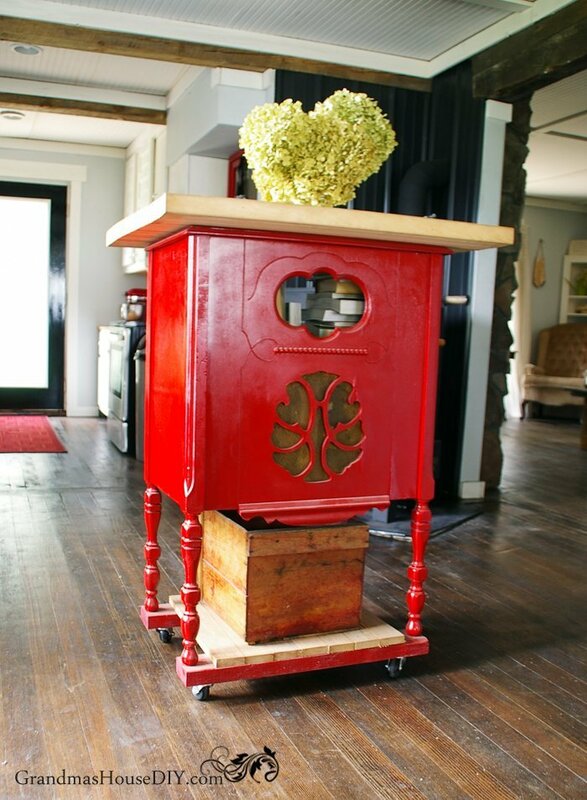 Just WOW – love the red too, turning this loved old beauty into something completely different and useful. Beautiful! I’ll be featuring your furniture flip at this week’s Friday Favorites Linky Party, thanks for sharing your beauty with us! Swing by and grab your featured button. Dawn thank you so much!! Very exciting! 🙂 Glad you liked it, we use that island every day and I just love having all of my cook books handy! Wow! This is an awesome transformation. I just love the red! Thanks for sharing with us at Welcome Home Wednesdays! What a cute idea. I love when you keep a piece around not knowing what you are going to do with it,and all of a sudden you create it into something beautiful and functional. I love your new kitchen island! Thank you so much Adele!! The radio was pretty, but you gave it a new look and use which it looks way better now! Love your butcher block by the way! Thanks for sharing with us at Sweet Inspiration party. Have a wonderful week. Hi Tarah, I’m visiting from the OMHGWW hop (which I found at Raising Samuels Homeschool). That is a sweet makeover! 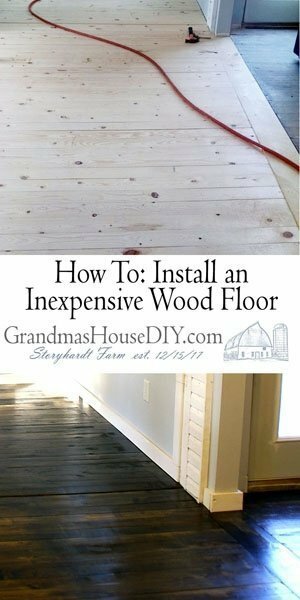 Generally, I’m not too much in favor of painting over old wood, but your project has me rethinking that! I would love to get a rollaway butcher block like that for our kitchen, because the cats keep jumping up on the counters and getting in the way. Hey LuAnn thank you for stopping by! I know exactly how you feel, I always hold my breath when I see someone painting over wood. In this case the veneer was in really tough shape so I thought paint was probably our best option. This is a great repurpose. I love the bold color you chose. It would make a wonderful addition to any kitchen. That looks great ~Thanks for stopping by! WOW! Stunning reformation! Really did a great job. I love the color red and how practical this will be for you. When one’s imagination runs wild amazing things happen. Thanks for sharing this with us this week at Party at My Place. Magnificent! Thank you so much! We’re very happy with it, love having a pop of red in our kitchen! What a great makeover. The red really makes the piece pop. I’m sure your grandmother would be proud. Please feel free to linkup on my Sunday’s Best Linky Party. You have great makeovers posted. Tarah, how fortunate that you have such wonderful treasures from your grandmothers. This makeover was beautiful. Thanks for sharing at Your Inspired Desgin Link Party. Oh it’s wonderful! I love when it’s possible to breathe new life into something. I love the red. This turned out great. What a conversation piece to have in your kitchen! Thank you 🙂 We love it! Thank you!! I’ll be there! So clever and I love the red! So glad I painted it red 🙂 It adds such a pop to our kitchen! Thank you for coming by! This is beautiful! 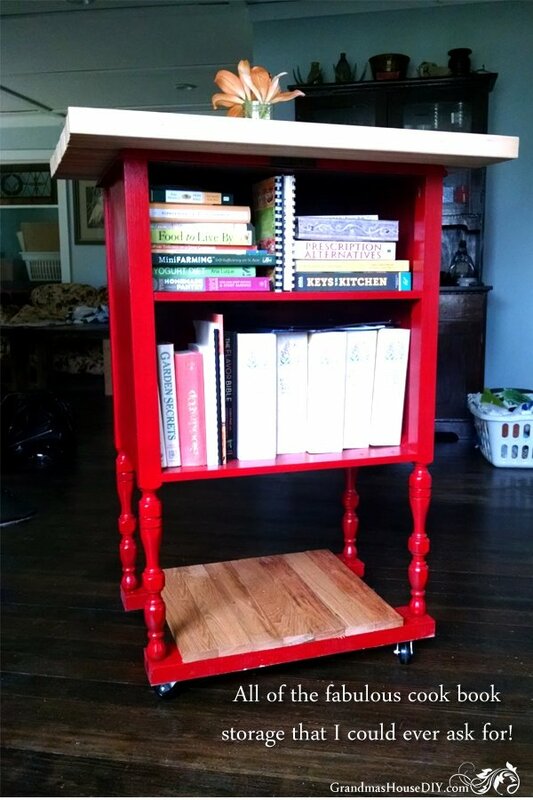 I love how you turned this into a kitchen island, it is so unique and the red really stunning! I would have used it as a side table or something, I’d have never thought of having it as a kitchen island. Love the idea!!! Katrin, thank you so much! /this is just darling – I could use a little island/microwave stand in my tiny 1940’s kitchen. I’I;m going to have to keep my eyes open! lol well that’s good to hear for sure! Thanks for coming by!! I love how you saved this sweet piece and turned it into something you can use! So cool! Thanks for linking up with Merry Monday this week. Great project, you obviously had a great vision! Thanks so much for sharing over at Celebrate Your Story! Thank you Chloe for coming by! Wow I love how you transformed this and made it really pop! My friend just bought a hutch that she wants to transform into something cool for her house, a show piece, and I think you really hit on the head. I should tell her about you did so she can see if she wants to emulate your idea. Thanks for sharing. Rania, thank you so much! And tell your friend good luck from me, I’m sure it will turn out amazing! So clever! I love red and this turned out so cute. I had an old radio cabinet like that years ago and got rid of it because I didn’t know what to do with it. Thanks for sharing with SYC. Hey Jann, I’ve seen lots of these old radio cabinet, they’re so hard to find a real use for them! Thank you for coming by! What a creative piece! Love the pop of color! Great job! Thanks for sharing at Dishing It & Digging It! Lori thank you so much! What a cute project!! And it turned out beautiful!! Thanks for sharing on My 2 favorite Things on Thursday!! Pinned! Wow! You have great vision to put this together. Love the bright color! 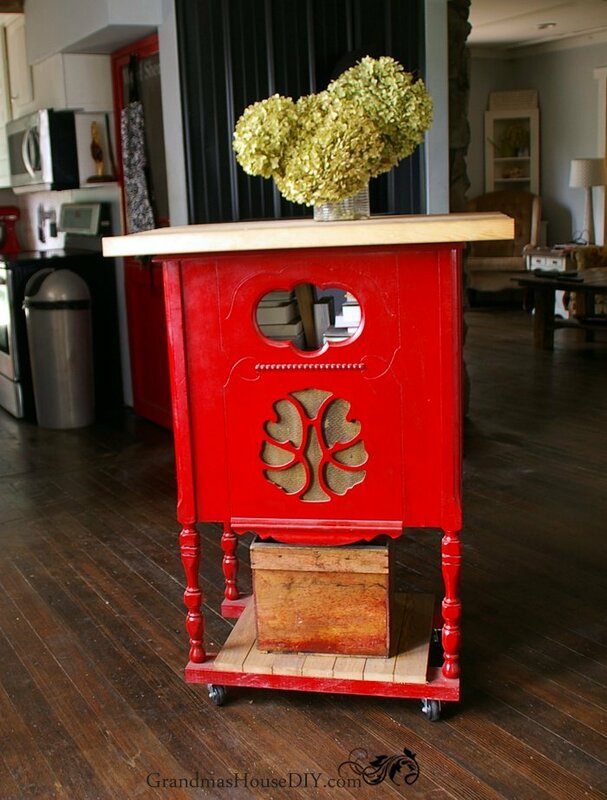 Lo-ove your red kitchen island. 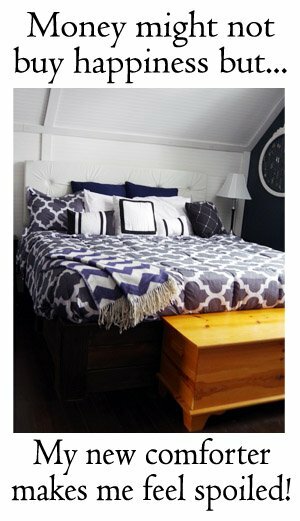 A good repurposed project makes me happy and this one has made my week! Thanks for sharing at the #ThisIsHowWeRoll Link Party. FANtastic idea!! We have one and its beautiful and ALWAYS in the way. Nowhere to put it. No way to use it…..
Hi Tarahlynn, I wanted to stop by to let you know that you will be featured in this week’s Simplify Wednesdays! Congrats! Carla, thank you so much! What an excellent upgrade!!! Love it!! Thanks for sharing at Hello Happy! This is lovely! I’m so glad you linked up with Bloggy Brunch. Your blog is awesome and I can’t wait to explore more of it! P.S. You were featured this week on my blog! Oh Pam thank you so much!! Way to use what you have! I’m very lucky my husband is good at building the things I want. He made me a little chicken coop this year. Thanks for sharing on Family Joy Blog Link-up. Please come back and join us again! Charlotte, thank you so much for coming by! We’ve been talking about making ourselves a little chicken coop too, someday! See you next time! What a really cool project / conversion! I love how it turned out and that red just POPS! This is fantastic! Thanks for sharing with the Let’s Get Real party. This will be my featured post at this week’s party. Looks amazing. Love the red. I keep a tin of red paint for special occasions. So clever. Visiting from Bloggers Pitstop. Thank you Tracey, yeah you just can’t beat red! 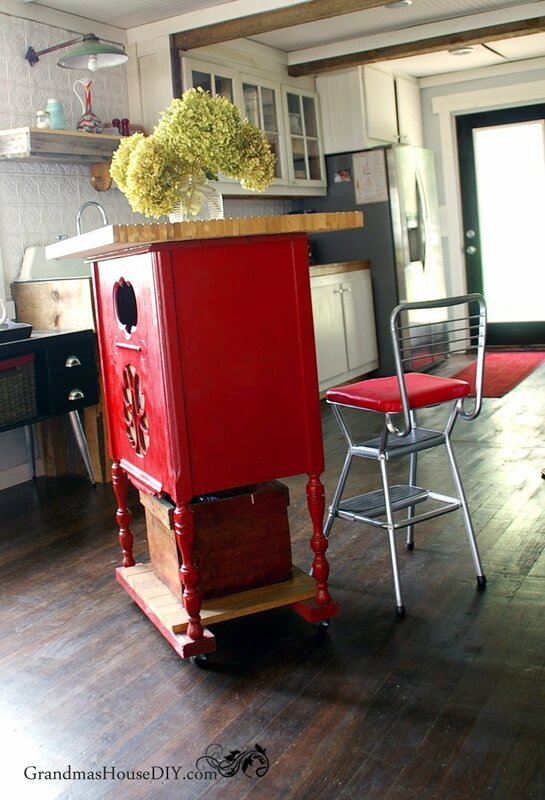 Wow what a Great Fun way to Repurpose that piece of Furniture into a kitchen Island. Thanks for sharing your creativity at the Pit stop! I love how this turned out! So fab! Thanks for sharing your project on the Monday Funday Party! Your radio stand looks amazing! 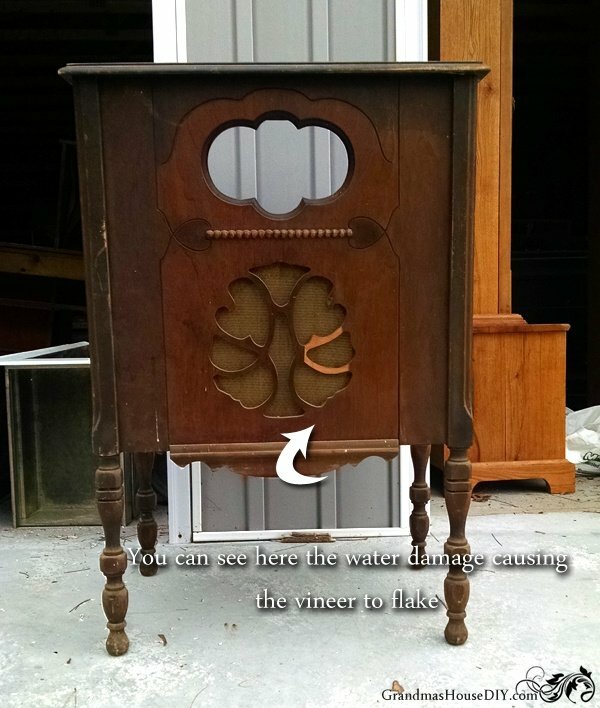 It’s almost magical when we can envision something in an old piece of useless furniture. One of my favourite pieces is a horrible faux wood stereo stand I found at a thrift shop. I brought it home, sanded it down and painted it white then distressed it. It looks like a dry sink only it plays music. 🙂 Thanks for sharing with us at No Place Like Home and enjoy the rest of your summer. Sandi, what a wonderful piece you made! I was so excited to have found a use for ours, it just sat there bothering me for years lol Thank you for coming by! Yowza! What a fantastic look. Such a beautiful piece to begin with. Every room looks better with one vintage thing in it and yours will be spectacular. How great that you can even store cookbooks in it and I love that you chose such a beautiful bold and unexpected color. Love It! Very cute, I love it. Nice to have your cookbooks in the kitchen when you need them. Nancy, I always wanted a spot for cook books in the kitchen – its so nice to have! Thank you! You are so very creative! Adorable. 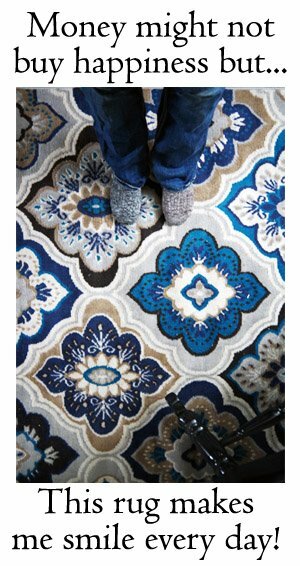 This project is right up my alley, and something I would totally create for my own space. I love your vision. Sometimes it just takes a bit of time for the piece to speak out and let you know what it wants to be lol…. great job Tara I will be featuring this project this week at Fridays Furniture Fix, thanks for participating a looking forward to seeing more of your works! Thank you so much Brenda, this one is one of my very favorite projects, we use it every day. I was so relieved when we found not just a use for it but a place where it could really shine and still be practical! No problem Brenda! Thanks again! I love how you repurposed the unit but still kept the essence of it ! This island and the matching stool are unbelievable cool. I cannot type enough great things about it, perfect functionality, perfect funk, perfect fun, perfect pretty are all adjectives that immediately come to mind. Great makeover, well worth the wait until you decided how to use this. Thank you Leanna!! This was one of those projects that seemed to just come out of left field so I tackled it on a wing and a prayer! Love this! So fun how you turned it into your kitchen island! Thanks for sharing at the Friday at the Fire Station Link-Up! What an amazing transformation! I love your before/after pictures. Thanks for sharing at My Busy Beehives #beeparty this week! 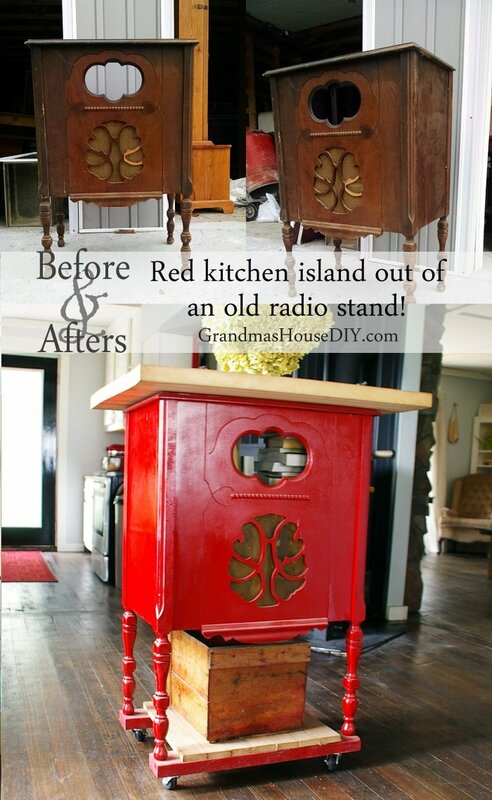 What a brilliant idea to turn an old radio stand into a kitchen island! 🙂 Thanks for sharing at Sew It Cook It Craft It. I love that read so much! What a fabulous recycle! Updated pictures are awesome! Thank you Lexie! This old radio stand I found out in our barn and it was confirmed by my mom that it used to be my great grandpa’s! Tarah… you always come up w/ great projects… and make things look like they were intended for that purpose all along. 🙂 It looks great. Great up-cycle project! I love the bright red color. (Here’s a piece where the wood wasn’t that great to begin with, so painting it was the best option). The piece is not only an attractive piece of history, but it’s also currently functional in your kitchen — win-win! Thank you Carol! Yup, in this case I totally felt that the wood was in bad enough shape (and veneer) so I felt ok giving it the paint/color I wanted in our kitchen! Wow! This is a great upcycle. I love that you used an old radio! Thank you for sharing at Ravenwould. 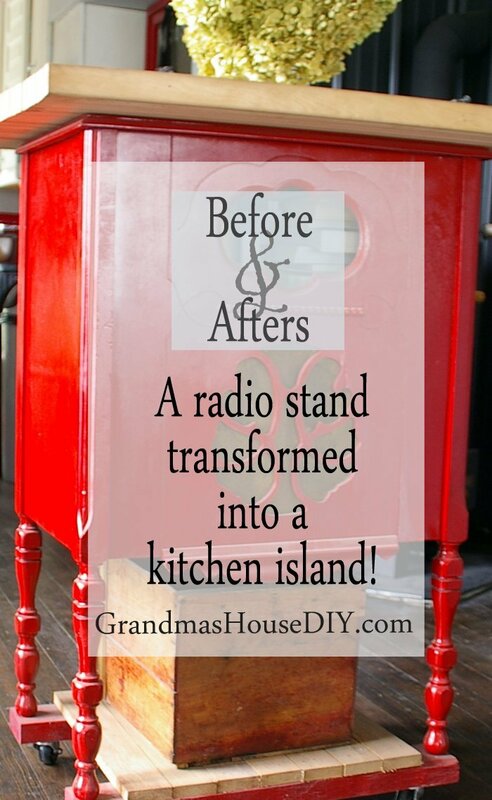 Love this project – it’s such a cool use for the old radio stand and it looks fantastic. I’m featuring it at Hearth and Soul this week. Thank you so much for sharing it. Have a wonderful week ahead. Another amazing transformation! I love it!! & thank you for linking up to Waste not Wednesday link party! Beautiful! So clever and functional! I love that you did the island in red. It is so pretty and one of a kind. Thank you Lisa, have a great week! Thank you so much for coming by, reading and commenting Vicki! What a brilliant transformation! I love upcycling projects. Thanks so much for sharing with #MMBC. Hope to see you next week! It looks great, you did a wonderful job. Love the new color! Thank you for sharing at The Really Crafty Link Party. Pinned! This is so cute and creative. Love the red paint. And then all that storage for cookbooks! You got me thinking. Thank you so much Theresa! Gosh I always dreamed of having cook book storage in my kitchen, so glad this worked out for that! Tarah, I love what you did with the old radio stand and in fact, all of your renovations! Thank you for linking up at Create, Bake, Grow & Gather this week. I’m delighted to be featuring you at tonight’s party and pining too. I love this kitchen island! You’ve inspired me to attempt some things at my own home. You will be featured tomorrow morning when the new Whisk It Wednesday Link Party starts. Thank you for sharing with us! Oh thank you so much Carrie! !